We have just started taking reservations for the 2019 season. this spring, summer, and fall. Retreat, has availability for a party of 2-5 people during the summer of 2019.
unlike most properties that who reservations over a year in advance. 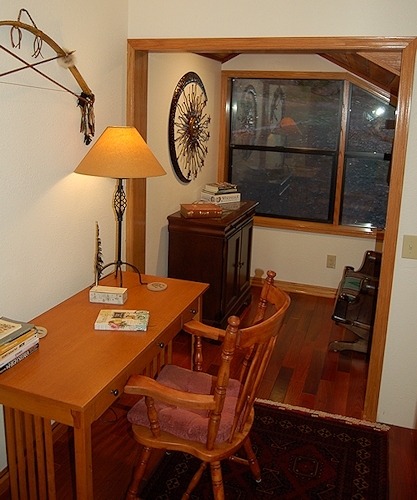 Rooms are available for most nights this spring, summer, and fall. We are approximately halfway between Yosemite Valley and Wawona. The turnoff to Henness Ridge Road is one quarter mile South of the junction of Highway 41 and Glacier Point Road. Fifteen minutes South of the breathtaking Tunnel View, which overlooks Yosemite Valley with views of El Capitan, Half Dome, and Bridalviel Fall. 15 minutes from the Badger Pass Ski area. The park is the size of Rhode Island so good planning is essential. 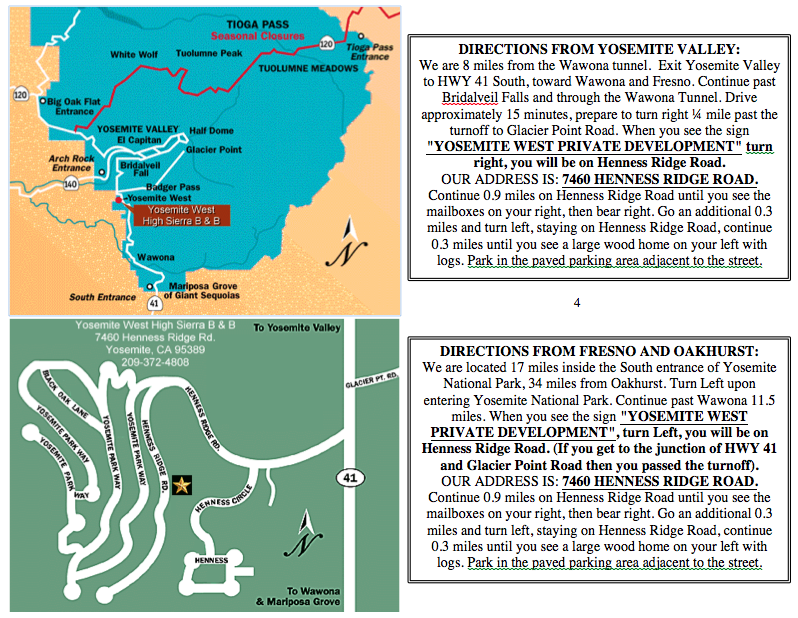 We provide expert advice on how to navigate Yosemite National Park to make the most of your time and avoid the crowds and traffic. Maps, guidebooks, daypacks, water bottles, beach chairs, and coolers are provided for guests to use during their stay. 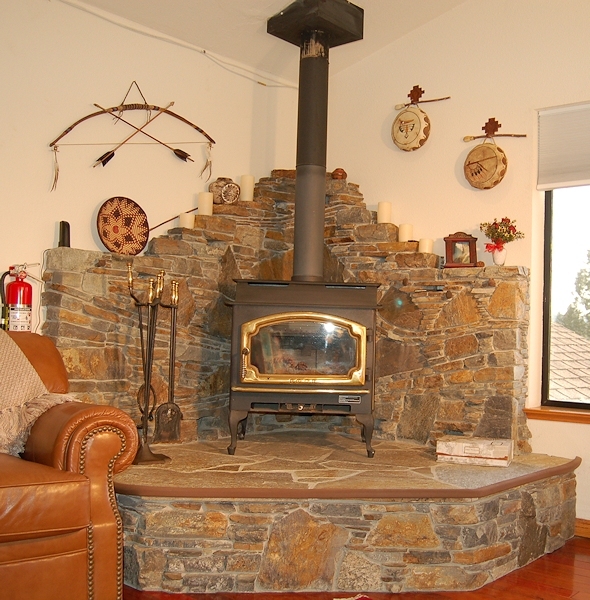 Yosemite West High Sierra Bed and Breakfast is a custom designed B&B nestled in Oaks and Pines high on a mountain ridge. 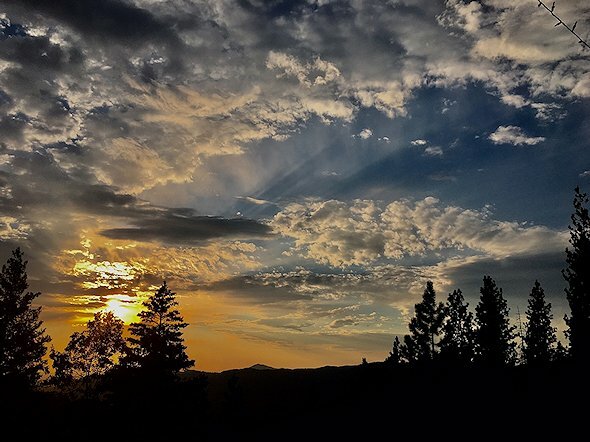 Guests enjoy spectacular sunsets from our decks and Great Room. The Great Room features a vaulted ceiling, large windows, beautiful stonework, large log beams, and a large wood burning stove. Relax and enjoy the silence and solitude of the mountains. 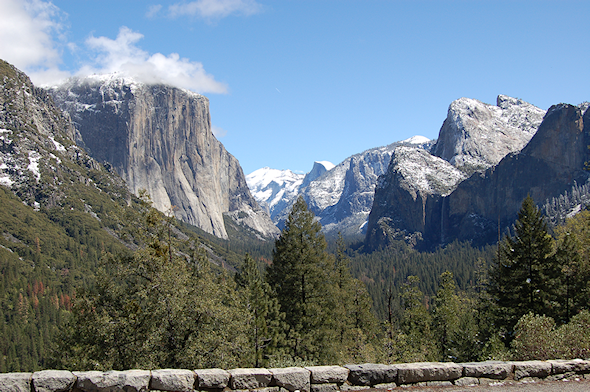 Our location, at 6000 feet elevation, is away from the heat and crowds of Yosemite Valley. Unwind and enjoy a unique opportunity to spend time sharing stories with guests from around the world. 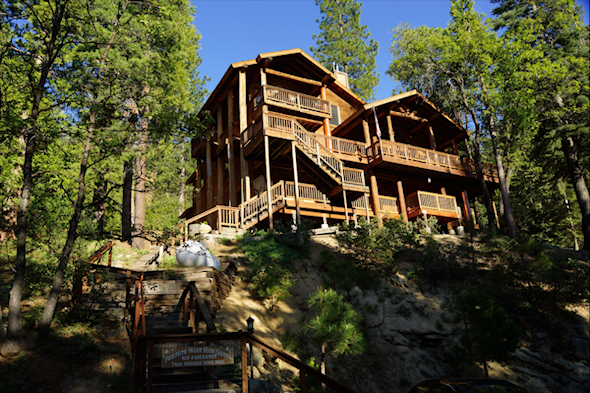 Conveniently located 1.5 miles off of Wawona road (Highway 41) on a quiet dead end street, yet just a short drive to the main attractions of Yosemite. Experience magnificent sunsets and a spectacular night sky blanketed with stars on our sunset view deck. Our family has explored the Yosemite area extensively on foot and on skis for several decades. 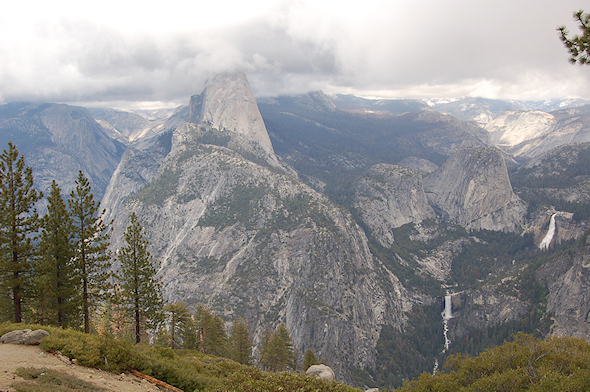 We provide expert advice on hikes and activities in and around Yosemite National Park. 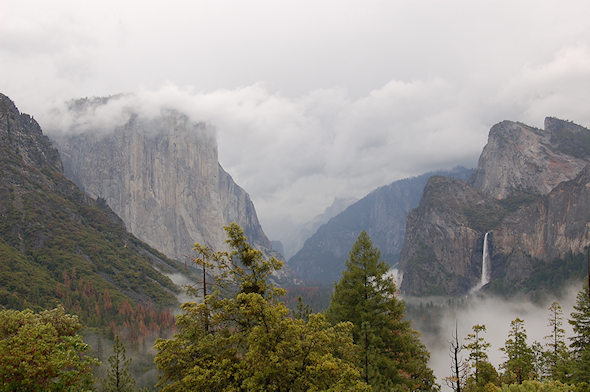 We are happy to assist you in planning wonderful trips around the magnificent Yosemite National Park. Our experience over the years has allowed us to find secluded places even during peak season. $280 to $360 per night, double occupancy, plus tax. 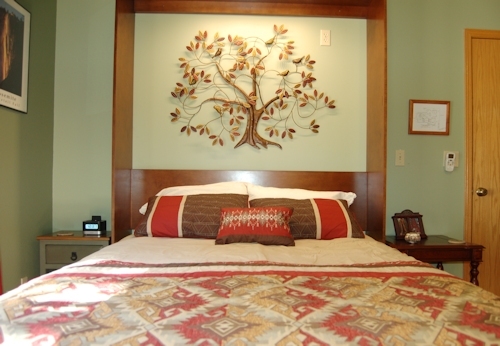 The price includes a delicious continental breakfast and complimentary refreshments. Full payment is required to secure your reservation. Payment is non-refundable, NO EXCEPTIONS! This includes, but is not limited to: early departure, change of reservation date, weather, utility outages, fires, etc. We recommend that you purchase "cancel for any reason" trip cancellation insurance. We have a small inn and almost all of our vacancies over the past 24 years were due to cancellations. ENJOY A UNIQUE YOSEMITE EXPERIENCE! Park Service requires all vehicles carry snow chains from October through April; chains may become necessary at any time. Check access over Tioga Road when planning your trip from the Eastern Sierra.